Home buyers of La Residentia projects staged a protest on Sunday over delayed possession of their flats in tower 19 and 39. 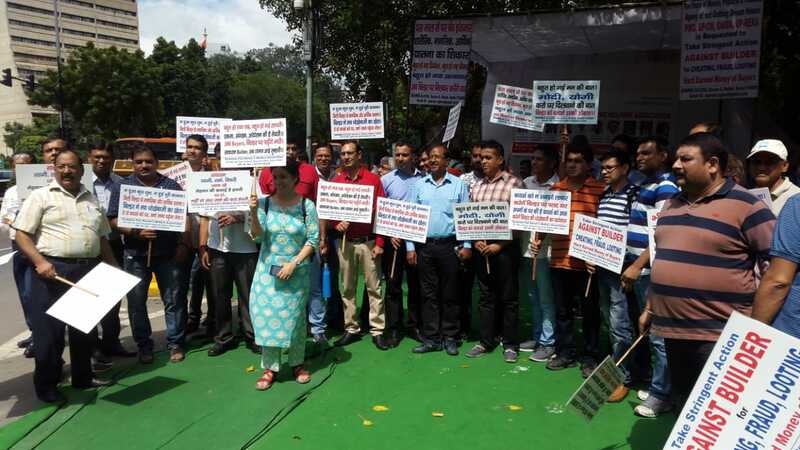 Buyers gathered near NDMC building in Delhi carrying ply cards in their hand and raised slogans against the builder. Women and children also took part in the protest. The buyers alleged that the builder had halted the construction of the tower in the unfinished stage from last one and half year. Whenever they talk to management regarding construction they make them fake promises by assuring them that construction will resume by next month. Now we the buyers have lost our trust in the management and so we have planned this protest. So that at least administration may take concern of ours and take action against the builder. Now buyers had demanded actual construction plan to get the timeline of the project up to completion and possession. Speaking about the same, a protestor said, “The directors have to take the responsibility of all this. They have to come out and talk to us about their plan that how they will be providing us with the possession and under how much time limit”.